Remarkable footage of elusive narwhal has been captured. A BBC team used aerial cameras to film the creatures during their epic summer migration, as they navigated through cracks in the melting Arctic sea ice. They believe the footage, which forms part of the BBC Natural History Unit's new series Nature's Great Events, is the first of its kind. Narwhal are sometimes called "Arctic unicorns" because of the long, spiral tusk that protrudes from their jaws. The appendages can reach more than 2m (7ft) in length; scientists believe males use them to attract potential mates. The BBC crew headed to the Arctic in June 2008, to film the tusked animals' summer migration. At this time of year, temperatures begin to rise above freezing and the thick sea ice starts to melt, creating a complex network of cracks that cover the white expanse. 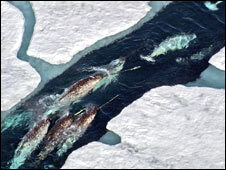 Every year, thousands of narwhal use these narrow fissures to travel thousands of kilometres, from the south of Baffin Bay to the high Arctic fjords. But tracking these animals down is not easy. Justin Anderson, who produced the programme, said: "Even though they are quite large animals, the area we had to cover was enormous - the size of Scotland. "It is like finding a needle in a haystack." A "dive" crew, equipped with underwater cameras, spent four weeks on the ice trying to locate the mysterious whales. But just as they caught a glimpse of them, the sea ice had become so dangerously thin that filming was forced to halt. However, an "aerial" team arrived by helicopter to take up the mantle. Mr Anderson explained: "It took us seven days to travel to the place where the whales had been spotted [Lancaster Sound] - we were stuck by possibly the worst thing you can encounter in a helicopter in the Arctic - fog. "But then we got there, we 'lucked out'; the skies cleared and we had eight days of 24-hour summer sunshine." Using a special mount, cameraman Simon Werry filmed the creatures from the helicopter, as the narwhal swam through the melt-water leads. Mr Anderson said: "This is the first time the narwhal migration has been filmed this way. It has been filmed from the ice, but this is the first time it has been filmed from the air. "It was an amazing sight. These animals are just so completely unreal - they are like something from mythology - and we were all just completely gobsmacked when we saw them." Thanks to their elusive nature, narwhal can prove difficult to study and there is still much to learn about these Arctic mammals. Mads Peter Heide-Jorgensen, from the Greenland Institute of Natural Resources, said the purpose of the creatures' summer migration remained a mystery. He explained: "The interesting thing is that these creatures feed in the deep water in the central part of Baffin Bay during the winter. "But when they are in the summer grounds, they hardly feed at all. "They are following the retreat of the sea ice as they have done for thousands of years, and spending summer in front of glaciers for reasons we do not really understand." 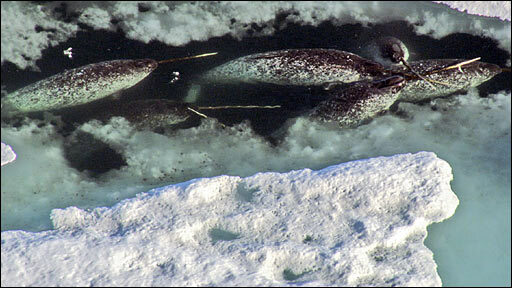 With such a connection to the Arctic ice, researchers are trying to establish whether narwhal will be affected by changes in the Arctic ice cover. Dr Heide-Jorgensen has been using satellite tags, which, as well as keeping track of the whereabouts of narwhal, are also able to monitor the temperature of the waters where the whales swim. He said: "They give us the temperature profiles in the wintering grounds and we can see the temperature of the deep areas has been increasing over the past 50 years. "However, we cannot yet see any direct effects of climate change on the narwhal."